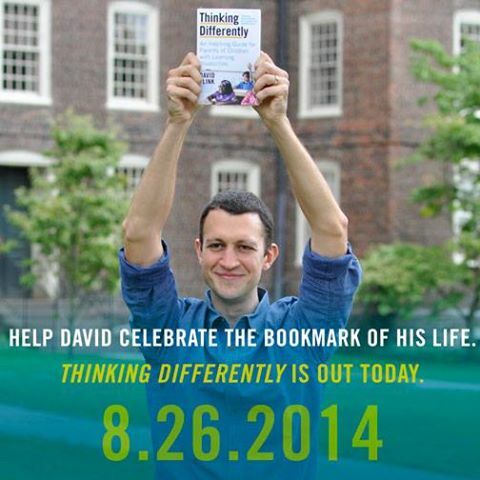 We're thrilled to spread the news that the new book Thinking Differently: An Inspiring Guide for Parents of Children with Learning Disabilities by David Flink is out today! David is the Co-Founder and CEO (for Chief Empowerment Officer) at Eye to Eye, a nonprofit and national grassroots mentoring movement with the mission to improve the life of every person with a learning disability. They fulfill their mission by supporting and growing a network of youth mentoring programs run by and for those with learning differences, and by organizing advocates to support the full inclusion of people with learning disabilities and ADHD in all aspects of society. "I’m writing the book of what’s possible with LD / ADHD. This is our movement’s next giant step in reaching out to help others. The book will be the definitive owner’s manual – written from our perspective – on how people with LD / ADHD learn, think, and grow. This is our story; the blueprint for anyone with LD / ADHD to achieve success when given the right support." Eye to Eye became a member of New Profit's portfolio last year, and is among other organizations in our Reimagine Learning domain that focused on learning differences and social/emotional learning.